Once upon a time, Jacobson’s Department Stores filled the luxury shopping niche in Metro ​​Detroit and Michigan. 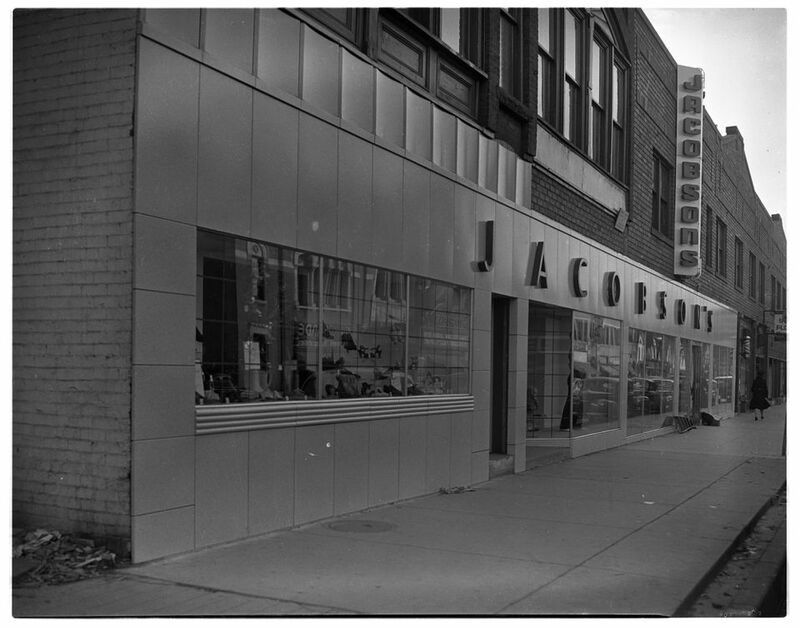 Known for its posh atmosphere, designer apparel, jewelry, home furnishings, personalized customer service, and fashion shows, Jacobson’s was a shopping tradition. Unlike the business path of J.L. Hudson’s, which eventually moved into and helped anchor metro-area malls, Jacobson’s kept to its independent, downtown locations. In fact, the recognizable brown buildings were well known in college towns, including East Lansing and Ann Arbor, where its stores served as a convenient meeting location, shopping venue, and dining alternative for students visiting with their parents. While the chain’s main market was in Michigan, several other states were home to the department store as well, including Florida, Indiana, Ohio, and Kentucky. In fact, the Florida stores formed the chain’s most profitable market in the late 1990s. That’s not to say the shopping experience was the same state to state; the Jacobson’s stores were divided into two management divisions -- north and south – that each catered to their region’s unique buying habits. The first Jacobson’s Department Store was opened in 1838 by Abram Jacobson in Reed City, Michigan. By the 1930s, the then chain had stores in Ann Arbor, Battle Creek, and Jackson. In 1939, Nathan Rosenfeld bought the chain, incorporated it and moved its headquarters to Jackson. He was also responsible for guiding the chain in its luxury specialization and multi-state expansion. The Jacobson’s store that opened in Laurel Park Place in 1987 was one of the chain’s highlights. The store was designed to look and feel like a spacious living room. Skylights, marble, and glass walls helped to create an atmosphere that was so posh and chic that it intimidated casually-dressed shoppers to the high-end mall. The chain’s initial decline began in the 1990s. The main reason was a general economic downturn, but the introduction of casual Fridays in the workplace and the influx of Nordstrom and Parisian stores into the Metro-Detroit market didn’t help. Even so, the chain continued to expand outside of Michigan and spent money renovating its existing stores. During this time period, the chain’s Florida market outperformed its market in Michigan. In spite of attempts to broaden the chain’s clientele by opening on Sundays, decreasing private-label offerings and focusing on a younger demographic, the chain’s profits continued to decline. In 2002, the company finally filed for bankruptcy after closing some of its poorer performing stores. Originally, the company filed for Chapter 11 and sought to reorganize. Later in the year, however, the Jacobson's chain went out of business completely and closed its remaining 18 stores. While some of the former Jacobson’s locations in Michigan were razed, still others found new life. The Von Maur chain swooped in to take over the few mall locations the Jacobson’s stores inhabited: Laurel Park Place in Livonia and Briarwood Mall in Ann Arbor. The original Jacobson’s location in downtown Ann Arbor is now a Borders. Most recently the seven-years-vacant Jacobson’s building in downtown Saginaw was purchased to create the New Covenant Christian Center. The center will include a restaurant, bookstore and 3,000-seat worship center. Whether in homage to the historic department-store chain or in a bid to take advantage of its loyal following, a long-time Jacobson’s shopper and fan in Florida bought the Jacobson’s name for $25,000 from the bankruptcy court. Tammy and Jon Giaimo eventually opened a new Jacobson’s in Winter Park, Florida. In addition to the name, the new owners tried to capture some of the original chain’s favored attributes, including the store’s penchant for designer labels and personalized shopping service. Unfortunately, the original Jacobson’s property in downtown Winter Park was already in redevelopment, which left the new owners to open the store in a smaller property (about ½ the size) in the same area. Their original plan was to open more Jacobson’s department stores in the chain’s former markets; but after several years in business, the new Jacobson’s in Winter Park was a solo act. It is now permanently closed.